Cheesie Mack is Not Exactly Famous by Steve Cotler. A Cheesie Mack Book. Review: Do you like comedy, suspense, and adventure? Than Cheesie Mack is Not Exactly Famous is a perfect book for you. 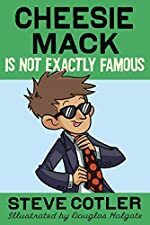 Cheesie Mack is Not Exactly Famous is the fourth book in the Cheesie Mack series. In this book Cheesie and Georgie find an artifact that makes them famous. Meanwhile Georgie's dad is getting married, Georgie loses the ring, and Cheesie has trouble getting the correct copy of a Harry Potter book with J.K Rowling's signature after Cheesie's sister copies it. I encourage you to read the book to find out how Cheesie switched the Harry Potter books and if Cheesie and Georgie found the ring. Cheesie Mack is Not Exactly Famous is intended for ages 10-12 because it has some harder words that I didn't know but it gives a definition on most of them. This book was a funny book and had pictures, lists, information that would be on Cheesie's website, and other areas like that to keep the book interesting. I also personally like how it tells multiple stories. It also refers back to stuff earlier in the book and stuff that happened in other books. Overall this book was really good so if you want to know how the rest of the story plays out you have to read it for yourself. We would like to thank Random House for providing a copy of Cheesie Mack is Not Exactly Famous for this review. Have you read Cheesie Mack is Not Exactly Famous? How would you rate it?